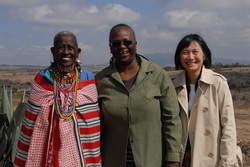 Pastors Victor and Anita Chan shared the gospel of Jesus Christ with the Masaai tribe, taught pastors at a local bible college and and evangelized Chinese immigrants in Kenya during their recent visit to our ministry. 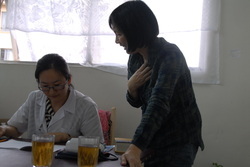 God opened the door for them to visit a young Chinese doctor's office and they led her to the Lord! Imagine this young doctor after reading testimonies of Christians in a magazine had been thinking "Why doesn't somebody come to tell her about God"? God sent Pastor Victor and Anita all the way from America unannounced to her office and they did just that! Praise the Lord! This 86 and 87 year old couple are radically passionate about sharing the gospel with the people of the world. 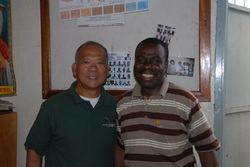 They shared testimony of their longevity in marriage with pastors and church leaders at a Bible College in Kenya. The also shared bible stories with children at a local Christian school attended by 80% Muslim children and purchased water tanks for one church in a Masaai village in Kenya so that Christians could have clean drinking water.